No. of post: 03 nos. Eligibility: HSSLC passed Proficiency in Computer Typing both English and Assamese. 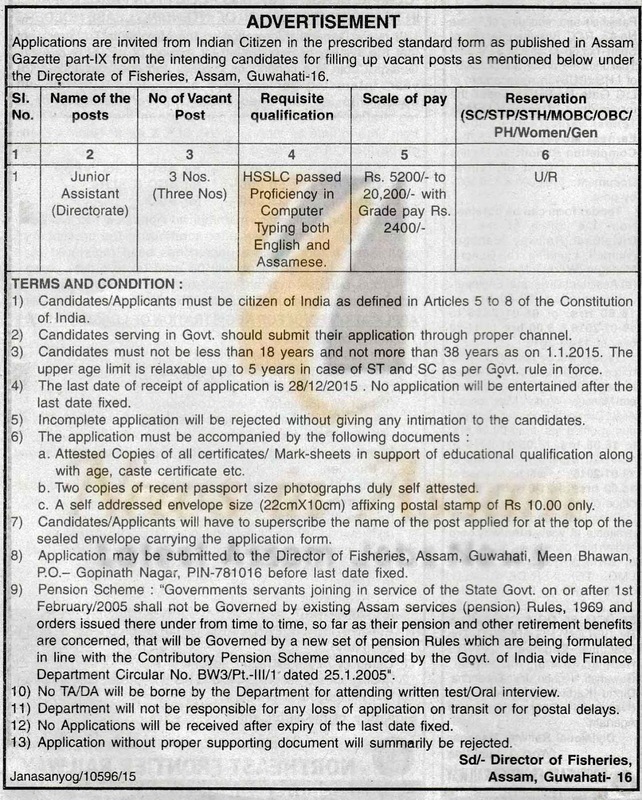 1) Candidates/Applicants must be citizen of India as defined in Articles 5 to 8 of the Constitution of. India. 2) Candidates serving in Govt, should submit their application through proper channel. 3) Candidates must not be less than 18 years and not more than 38 years as on 1.1.2015. The upper age limit is relaxable up to 5 years in case of ST and SC as per Govt, rule in force. 4) The last date of receipt of application is 28/12/2015 . No application will be entertained after the last date fixed. 5) Incomplete application will be rejected without giving any intimation to the candidates. a. Attested Copies of all certificates/ Mark-sheets in support of educational qualification along with age, caste certificate etc. b. Two copies of recent passport size photographs duly self attested. c. A self addressed envelope size (22cmX10cm) affixing postal stamp of Rs 10.00 only. 7) Candidates/Applicants will have to superscribe the name of the post applied for at the top of the sealed envelope carrying the application form. 8) Application may be submitted to the Director of Fisheries, Assam, Guwahati, Meen Bhawan, P.O.- Gopinath Nagar, PIN-781016 before last date fixed. Department Circular No. BW3/Pt.-lll/1 dated 25.1.2005″. 10) No TA/’DA will be borne by the Department for attending written test/Oral interview. 11) Department will not be responsible for any loss of application on transit or for postal delays. 12) No Applications will be received after expiry of the last date fixed. 13) Application without proper supporting document will summarily be rejected.